Ewald Maly via Flickr, licensed cc. I love legends. I always have. I am particularly fond of legends that attempt to explain things such as why the robin has a red breast, or why it snows on Christmas, or why the donkey says "hee haw," and other things like that. That is one of the reasons I was drawn to this little book by Tomie dePaola, The Legend of the Poinsettia . Lucinda is a young girl who lives with her parents and younger siblings in Mexico. The colorful illustrations have that southeastern feel to it. Lucinda's community is preparing for Christmas by preparing gifts for the Christ child on Christmas Eve. I loved that the focus of gift giving was for Christ as opposed to the hustle and bustle and commercialism that is so common in American households. The gifts were labors of love too and involved special crafts, skills or homegrown gifts. Lucind and her mama have been asked to weave the special blanket for Baby Jesus as the one they have used for years is very old and worn. When Lucinda's mama becomes ill, Lucinda is unable to finish the blanket by herself and the more she tries, the more tangled the yarn in the loom becomes. Lucinda is disheartened and worried about her mother, as well as saddened that her family has no gift to give the Christ child. Suddenly an old woman appears and suggests Lucinda pick some simple native weeds and bring them to Christ. 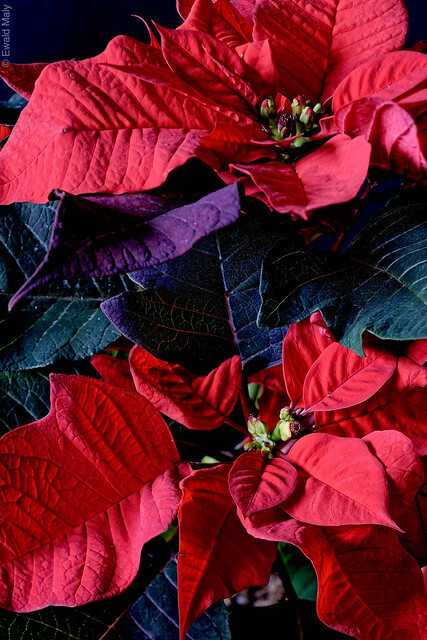 In humility, Lucinda does that, and as you can guess, these become the beautiful poinsettia plants, the flor de la Nochelbuena, that we associate with Christmas today! The reference and picture of Our Lady of Guadalupe was a nice touch for Catholic children who are familiar with story, and it was nice to see the shrine to our lady as part of Lucinda's everyday life. My children identified with Lucinda's fears for her mother, and also her fear of being different from the rest of the community. They also felt it was very brave of her to come forward with such a simple gift in the face of much splendor. After reading the story, my kids also became more aware of the poinsettias at church and other places and we even bought our own! Overall I think this is a very nice book to read during the Advent season in preparation for Christmas, and a nice way for the family to focus on what is most important during this beautiful holiday.